Tripoli's Lone Chinese Restaurant Still Delivers Many foreigners fled the crippled Libyan capital as the uprising there turned to war. But one Chinese restaurant is still open for business — though customers are few. "If I left, I would lose everything I have here," owner Dai Songxian says. Most foreigners fled Libya earlier this year when a popular uprising to oust Moammar Gadhafi turned into a brutal war. But in Tripoli, one Chinese family that runs a restaurant is trying to hang on. 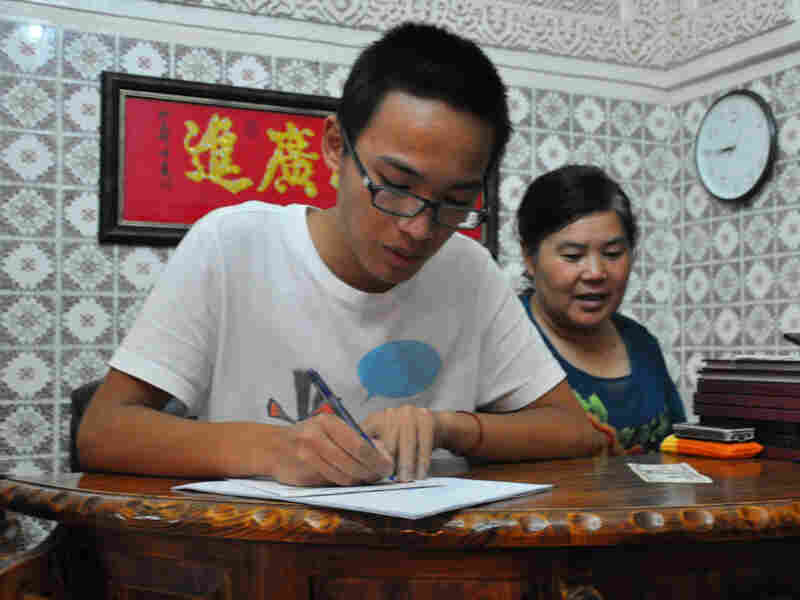 Dai Songxian (right) and her son, Alex, take a food order. They run the only remaining Chinese restaurant in Tripoli, as fighting has caused other foreigners to flee. Few people come to al Maida Chinese restaurant, which once counted Gadhafi's son, Seif al-Islam, among its customers. NATO airstrikes and gun-toting thugs make eating out an unsavory prospect for most people still in the capital. The exceptions are foreign journalists seeking an escape from the lackluster cuisine of the hotel they are restricted to by the Libyan government. It takes a week of nudging Libyan officials for NPR and The Washington Post to get permission to go to al Maida. A government minder and driver are assigned to tag along. They aren't keen on Chinese food or the pop music playing in the restaurant. So after a quick look around to make sure the reporters aren't secretly meeting anyone for an interview, they head back to the van. Restaurant owner Dai Songxian beams as her son jots down the reporters' orders. One or two customers are all she can count on these days. The 55-year-old is proud of her waterfront restaurant, which is decorated with red lanterns. A statue of the Chinese god of wealth and fortune and a much larger picture of Gadhafi adorn the front hall. I gritted my teeth and decided to wait and see what would happen ... I didn't know it would drag on for so long. She says she first came to Tripoli in 2004 to open a clothing store for women. "But we discovered that Libyan women were very fat," she says. "So we changed to the restaurant business." Her dishes reflect the cuisine of her native Zhejiang province along China's eastern coast. She serves no pork or alcohol in keeping with Libya's Islamic laws. Dai had high hopes for this place, which she says her family spent hundreds of thousands of dollars on to rent and renovate earlier this year. A month later, the war broke out. "If I left, I would lose everything I have here. So I gritted my teeth and decided to wait and see what would happen," she said. "I didn't know it would drag on for so long. The uprisings in Tunisia and Egypt were over in a couple of months." The three other Chinese restaurants in Tripoli have since closed. Even Dai's spotless kitchen is shuttered until the journalists call. 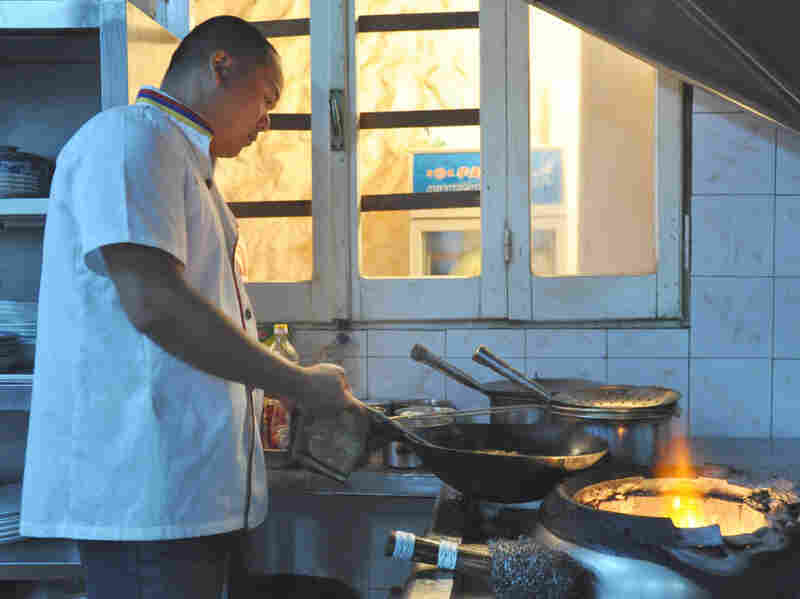 Chef Lao Wei Xiong cooks up a carry-out order for foreign reporters in the kitchen at al Maida restaurant in Tripoli. The food is surprisingly good, considering ingredients are hard to come by with a growing food and fuel shortage in Libya. Their delivery truck is out of gas. So Dai's son, Alex, delivers take-out orders by taxi to the journalists. It's a long trip through the many security checkpoints. The 21-year-old says the police stop him and ask him the same question every time. "'Where are you from?' I say 'China' and they say, "OK, China. Go!" he says. One of the restaurant's fans is Wang Yuguo, a correspondent for China Central Television who is on assignment in Tripoli. "Comparing with the food in China, I think it's in the middle, but upper, a little bit upper, so ... I'm satisfied," he says. Wang notes that Chinese people often operate restaurants in war zones. He says the owner of the Golden Key Chinese restaurant in Kabul told him it's because he can make a lot of money when there is no competition. But Dai says she doesn't know how much longer she can hold on if business doesn't pick up. She says she's already had to let six of her 15 staff members go.